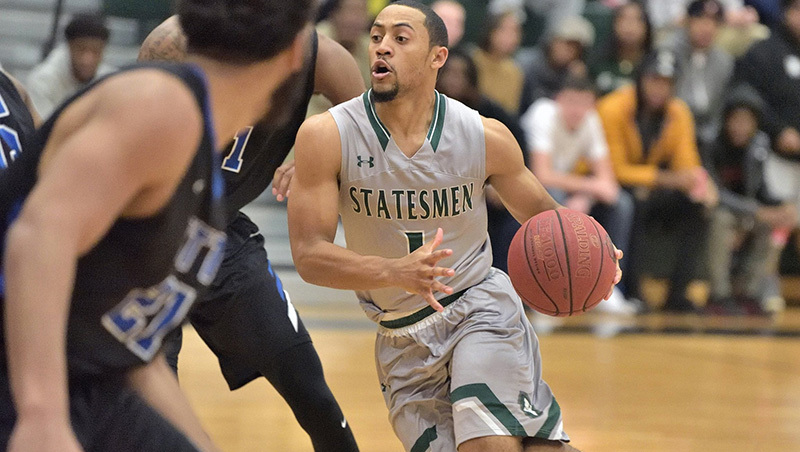 SOUTH PRINCE GEORGE, Va. — Sophomore Robert Smith/Hampton scored a team-high 17 points, and classmate Stanley Taylor/Petersburg added 15 points, to lead Richard Bland College to a 105-87 Region 10 men’s basketball victory past Guilford Tech (N.C.) on Saturday afternoon in Statesman Hall. Sophomore Tre’ Patterson/Richmond finished with 14 points and 10 rebounds off the bench for the host Statesmen (14-5, 8-3), who have won three-straight games. Jaylon Jeffries led the visiting Titans (7-10, 1-9) with a game-high 21 points. 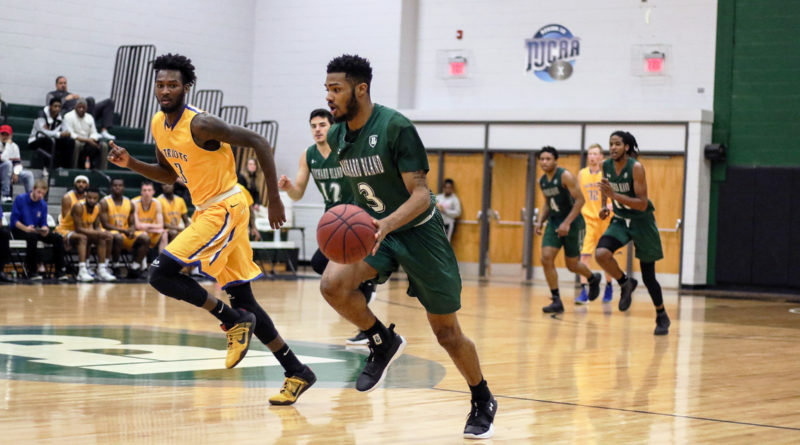 Richard Bland trailed early at 7-3 just 3:40 into the game and was behind 14-8 at 14:08 following a three-point field goal. The Statesmen battled back with a quick 10-2 run to lead 18-16 at 9:30, getting a three-pointer from Taylor to start the run, and a three-pointer from redshirt-freshman Miodrag Dronjak/Kladovo, Serbia to end it. The advantage was five for the hosts at 28-23 after back-to-back slam dunk by freshman Kenny Southerland/Richmond at 5:24, both assisted by sophomore Tim Bing Jr./Suitland, Maryland. 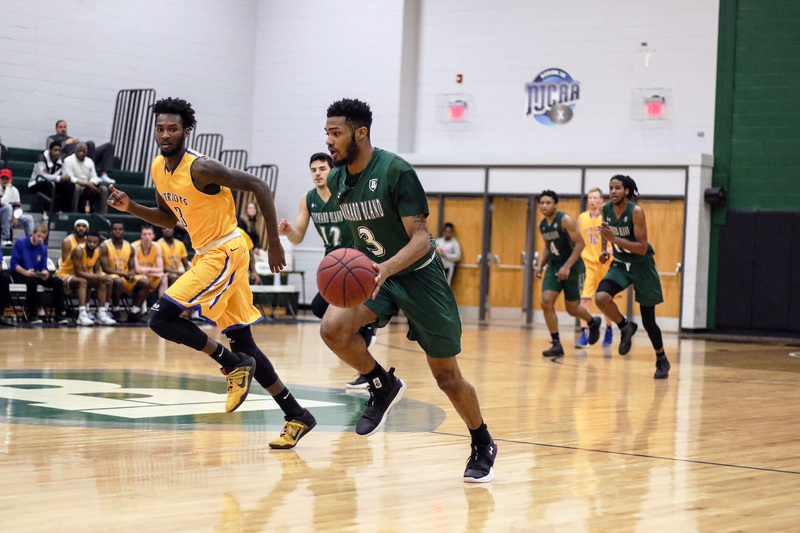 The Titans scored eight unanswered points to lead 31-28 at 3:48, but Richard Bland responded with 11-straight points to lead 39-31 at 2:02. Taylor had the first eight points, including a dunk, while Bing closed with a three-pointer. Guilford Tech, though, scored the final eight points of the half to tie the contest at 39-39 at the intermission. Guilford Tech continued its momentum to begin the second half, leading 45-39 at 19:07, and the lead was 53-48 at 16:23. Richard Bland answered with a 12-4 run to lead 60-57 at 13:27, following a layup from Smith. It was tied at 60-60 with 13:05 remaining, but the Statesmen took the lead for good at 62-60 courtesy of a dunk by Smith at 12:03. The Titans managed to get within 65-64 at 11:02, but was no closer than six points over the final 7:52. Another layup from Smith made it 91-73 at 4:05, and a layup by freshman Ryan Jones/Smithfield made it 99-80 at 2:05. Sophomore Deon Joyner/North Charleston, South Carolina added another dunk with 25-seconds remaining, and the visitors made a three-pointer at the buzzer to provide for the final margin. Smith led Richard Bland with his team-high 17 points, adding seven rebounds and five assists. Taylor finished with his 15 points, adding seven rebounds, as well. Patterson had 14 points and a game-high 10 rebounds for his second double-double, while Southerland had 13 points and nine rebounds. Jones contributed 12 points, three assists and three steals, and Joyner had 10 points and eight rebounds off the bench. Bing added a game-high 10 assists along with three points. Richard Bland shot 54% (46-85) from the field, including 24% (6-25) on three-pointers, and 47% (7-15) at the free throw line. Jeffries led Guilford Tech with his game-high 21 points, adding eight rebounds and three steals. Eric Peaks and Drew Cone each finished with 15 points, while Tamario Rodgers had 13 points. The Titans shot 43% (32-74) from the field, including 39% (13-33) on three-pointers, and 63% (10-16) at the line. 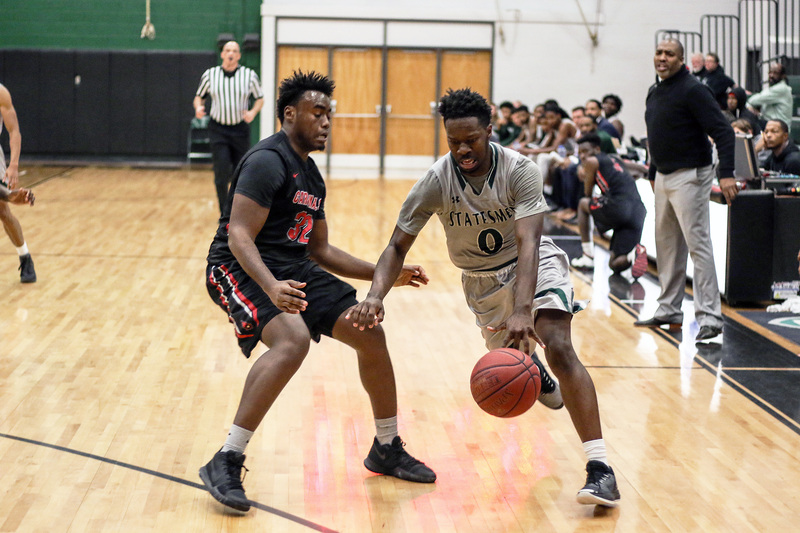 Richard Bland and Guilford Tech were playing for the ninth time in the sport of men’s basketball, and the Statesmen have never lost to the Titans, now leading the series 9-0. 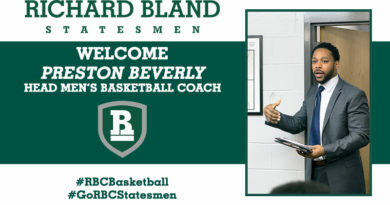 Richard Bland remains at home in Statesman Hall and will welcome Lenoir (N.C.) on Sunday, Jan. 28, at 3 p.m. The contest on Sunday has been designated as the program’s Peter Paul Development Center Appreciation Game.